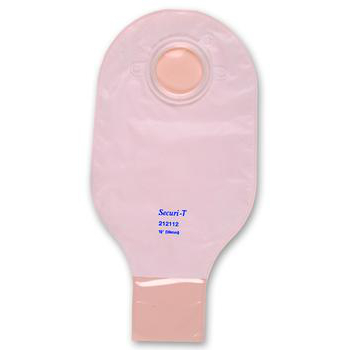 The Genairex Securi-T™ 12" Two-Piece Drainable Pouch is an opaque ostomy pouch with two-sided comfort panels and 1 curved tail closure. The Genairex Securi-T™ 12" Two-Piece Drainable Pouch is an opaque ostomy pouch with two-sided comfort panels and 1 curved tail closure. Flange sizes range from 1 1/4" (32 mm) - 2 3/4" (70 mm).